Who doesn’t love a doughnut every once in a while? The fresher the doughnut the easier it is to become an addict. If you are addicted to freshly deep fried doughnuts, now you can have your cravings quelled by investing in the Dough-Nu-Matic. The freshly fried dough may scald you incredibly badly, but be patient and you can enjoy your very own doughy goodness. Why stop by a Krispy Kreme or a Dunkin’ Donuts when you can prepare your very own before you leave for work in the morning?! This bad boy will only eat up 23″ x 7″ x 14″ of valuable counter space. 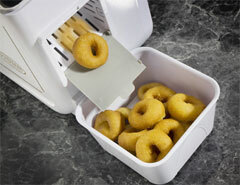 The Dough-Nu-Matic shapes the doughnut, fries it, and dispenses it into the hopper in under a minute. Let them cool, and you can enjoy a fresh doughnut during your daily commute. Of course, you may be adding quite a bit of girth to your waistline if you are partaking in fresh doughnuts every morning, but I challenge you to pass up a fresh doughnut if you have the ability to make your own at the drop of a hat. Take a look at this video and you may not be able to resist. No starch, hold the hangers and plastic bags, please. Belkin has a solution that adds virtually nothing to your desk space and keeps the iPod wires where they belong — out of sight. Over the course of the last week, I’ve been reading all of your wonderful comments to our Getting to Know You post. Wow! I never imagined such a robust response!! Thank you, thank you. One of the things that impressed me was the positive attitude present in almost every single one of the comments. When you talked about the organization challenges that you face in your homes and offices it wasn’t with a sense of defeat, but with the attitude that you just haven’t found the solution. It was truly inspiring. Another thing worth mentioning is that many people said that they enjoy reading post comments. I agree. Almost every day I learn another technique or strategy for organizing my home and office from reading the comments. Every now and again we get a bad apple comment, but for the most part they are helpful and informed. If a particular post speaks to you, then be sure to watch and contribute to the comments. I also want to thank everyone for the compliments you gave to Matt, Teri, Brian, and me. We appreciate your kind words. If you didn’t make suggestions for future post topics in the comments section of the Getting to Know You post, feel welcome to leave your ideas in the comments to this post. We want to help you, so voice your opinions! And, stay tuned for future reader inspired posts. We wrote about the Kindle when it was first released back in November of last year. Upon its release, Amazon underestimated the demand and a waiting list was awaiting customer orders. 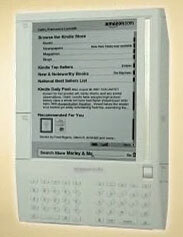 Amazon has since increased production and the Kindle is now available for immediate shipment. Ever since we released our wireless reading device Kindle last November, we’ve been unable to keep it in stock, and we’ve had to work hard to increase manufacturing capacity. Today, we’re excited to announce that Kindle is in stock and ready for immediate shipment. We’ve also been adding selection. Since launch, we’ve added 25,000 additional books, blogs, magazines, and newspapers that you can download wirelessly to your Kindle, bringing the total to more than 115,000. Go forth and read all the e-books you would like without worrying about bookshelf space. Seven years ago, I worked for an economic research firm as a public relations executive. I made excellent money, and I was good at my job. I even liked my boss. Every second I was at work, though, I wanted to shove a hot poker into my eye. When I would sit in bed at night, in those moments before sleep, the phrase “unfulfilled life” continuously looped through my mind. I still can’t tell you exactly what it was that was so awful; I was just in the wrong job, on the wrong path, and every ounce of me knew it. Fast forward to the present. I don’t make close to what I used to, I work longer hours, and some days I’m downright awful at my job (see the comments to my Semi-Homemade Cooking post for proof). The difference is that I’m now in the right job for me, and at the end of every day I am thankful for this blessing. I get to write full time about a topic I love and interact with incredible readers and an amazing staff. Somewhere along the way, my husband and I sat down and talked about what were the most important things in our lives. At the top of the list was our relationship. Also on the list, and in no particular order, were our family, friends, pets, food, shelter, spirituality, happiness, and being able to save money for our future children and our retirement. We agreed that we want careers, we are passionate about working, but believe that our careers should match our priorities and not the other way around. My husband quit the job he had seven years ago and started a company. I quit the job that made me miserable and eventually started working at Unclutterer. Both of us manage staffs across the country, but telecommute from our home office. Our desks are literally seven feet away from each other. We ran the numbers, and this decision to work side-by-side results in us spending 2,200 more hours together a year. And, since our top priority is our relationship, our working arrangement is in line with that priority. Would I love it if someone wanted to give me huge bundles of cash to do my job? Of course I would. But, right now, a massive salary isn’t my top priority. I’m glad that other people choose to live differently than we do. The world would be an incredibly boring place if we were all the same. (Additionally, I think many couples would hate it if they spent 24 hours a day together.) My point is that a person doesn’t have to remain in a job he or she hates just because the pay is good. There are always other options. Think about what you would do if you were downsized out of your current position, and follow that path. Consider a career that aligns with your life priorities. Apply for a job in a field that interests you intellectually. Or, if spending more time with your family is your priority, look for a job closer to your home so that you don’t have to make a two-hour commute every day. The change can be lateral, it doesn’t have to be for less money. But, if it is for less money, look for ways you can reduce your expenses. Only you know what changes you could make and how you would make them. Just remember that your career doesn’t have to be a punishment, and, if 40 percent of your life is spent working, it should at least reflect your life’s priorities. If you have children, you may be interested in following the blog Zen Habits. Leo has six children and made a career change in much the same way I made mine. He talks about this decision on a pretty regular basis in his writing. 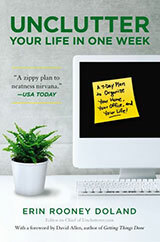 Also, if you need to stay in a job you hate on a temporary basis, you might want to check out the post How to Keep a Bad Job from Affecting Your Home Life that I wrote for RealSimple.com. Speaking of careers, you also may be interested in my post today on RealSimple.com about the possessions of a long-haul semi driver. It’s titled, Simple living, trucker style. LeAnn Peterman, an organizational specialist from Fond du Lac, said it’s important to ask yourself why you’re holding on to an object. Items that have a strong sentimental attachment should be organized in a manageable system — taking a picture of an item still retains the visual memory but not the actual bulk of the item. Pass along items to others that may have a more sentimental value to them such as cards, pictures or news clippings. Pictures that you cannot identify should be tossed or donated to a local historical society. Set your criteria and don’t do it alone. If you tend to hoard, invite a person opposite of yourself to help make sensible decisions, they said. Erin has written on photographing sentimental items on a couple occasions that you may be interested in exploring. One for parents stuck with their kid’s left behind items, and one on photographing your mementos. 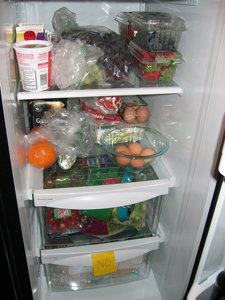 Have you ever tried eating better but still had forbidden foods in the cabinet and refrigerator? You probably thought, “I don’t want that food to go to waste!” I’ve done it every time I’ve recommitted myself to healthier eating … until now. Now that the college basketball season is over, it’s time to get back on track and eat better. In past attempts, I have left all of my not-so-great food in the cabinets — processed foods, pasta sides, etc. — thinking I’ll want to eat them again someday. In an effort to unclutter my life though, I decided to remove the forbidden foods from the cabinets. And I feel liberated! I feel calmer and more ready to dedicate myself to a lifetime of healthy eating. When I go into the kitchen, I don’t have to think about the fact that I’ve changed my diet. I just need to eat what I have available. And if I get a craving for something unhealthy? I’ll have to find other options until the craving is satisfied or passes. So what do you do with all of the undesirable food? You have a few options. First, I tossed all of the junk food. It’s not healthy and I never should have bought it in the first place. Second, I chose to put the not-so-bad foods from my pantry in recycled grocery bags and temporarily stored them on a shelf in a different room. That way, I’ll be able to eat them in moderation once I get into better habits, but I won’t have to think about them until I’m ready. Third, I moved the refrigerated not-so-bad foods to the bottom drawer of the refrigerator and labeled it “NO” with a yellow post-it note. Again, these are foods that will be okay in moderation once I get into healthier eating habits. You also can donate your not-so-bad food to a local food pantry. This is a great option for those times when you clean out your cabinets and realize you’re never actually going to make anything with those canned artichokes. Good luck to everyone starting on a healthier eating plan! Procrastination is an equal opportunity affliction, according to one of the field’s pioneering researchers, Joseph R. Ferrari of DePaul University. Women are just as likely to exhibit the behavior as men; 20-year-olds are as prone to it as 65-year-olds (much older people, seem to lose the habit). 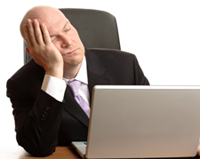 His studies have also found that white collar employees procrastinate more than blue collar workers, salespeople more than middle managers, business executives more than doctors or lawyers. Arousal procrastinators are thrill-seekers who tackle projects at the last minute, pulling all-nighters at school and work. Decisional procrastinators are paralyzed by indecisiveness. Be sure to check out the sidebar to the article with advice from Geralin Thomas on ways to curb procrastination. Also, you might enjoy reading the link at the bottom of the page to a Psychology Today blog post on the same topic. 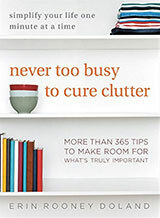 When I procrastinate, it is definitely in the “avoidance” category, especially when it comes to organizing my home and office. How about you?